After the time of the life of Jesus Christ (A.S) on earth, so many people have misunderstood the life of Jesus Christ (A.S) and his mission. Some said: He is god, some said he is son of god, some said he is incarnation of god. Some said he is the incarnation of holy spirit. The people in his time believed in him as the Prophet of God, as one of the highest Prophets, as the rescuer of the children of Israel sent by God as a Messenger to the tribes of Israel. Since people are confused and they are confusing others too, I am inspired to write about an article since a few days ago. But I was just completing Naqshbandi principles on naqshabandi.wordpress.com in those days. Jesus Christ (Peace be upon him) did not establish a new (Christianity) religion nor he followed the religion of Jews (Judaism) ,just as Moses (A.S) did not establish a new (Judaism) religion, nor Abraham did establish a new religion!. No prophets establishing their own religions. From Adam (A.S) up to last Prophet (alaihiswalathu wa salam), all Prophets were Muslims and their religion was Islam which means Submission to God. This is why we do not see a name of religion in Psalm ,Deuteronomy ,Numbers, Songs or New Testament books, Hindu books, Buddhist books or other books that is ancient or coming from the line of Prophets. Prophet Jesus Christ (Peace be upon him) is a great Prophet of God. We Muslims believe he is born as holy and is infallible like other Prophets. He has been given nearness to God and high spiritual wisdom. Imam Malik (94-179 H./716-795 CE) Imam Malik (r) said, “Whoever studies jurisprudence (fiqh) and didn’t study Sufism (tasawwuf) will be corrupted; and whoever studied tasawwuf and didn’t study jurisprudence will become a heretic; and whoever combined both will be reach the Truth.” This saying is mentioned and explained in the book of the scholar ‘Ali al-Adawi with the explanation of Imam Abil-Hassan, a scholar of jurisprudence, vol. 2, p. 195. As Muslims we believe all Prophets were born infallible and perfect, with only the Will of God prevalent in them. The Bible says that Jesus Christ (A.S) had gone through the Process of Purification of the Self (Tazkiya/Sufism) before dressed with Divinely given authority. It is clear that he was dressed with authority after his trials and tests, and salvation is only by obeying the Prophet of God, not by just believing in some man made doctrines! Daniel 2:46 New Living Translation Then King Nebuchadnezzar threw himself down before Daniel and worshiped him, and he commanded his people to offer sacrifices and burn sweet incense before him. Hebrews 5:10 and was designated by God to be high priest in the order of Melchizedek. Hebrews 2:9 But we do see Jesus, who was made lower than the angels for a little while, …. So since when the theory that says Father , Son and Spirit are eternally equal came to exist?, so if the New Testaments Apostles did not believe so, then whose faith is correct? Mark 1:9-10 At that time Jesus came from Nazareth in Galilee and was baptized by John in the Jordan, Just as Jesus was coming up out of the water, he saw heaven being torn open and the Spirit descending on him like a dove. Here we see, Christ (A.S) receiving the guidance and support of Holy Spirit. Roohul Qudus (Pece be upon him). God says, Quran 2:87 And We did certainly give Moses the Torah and followed up after him with messengers. And We gave Jesus, the son of Mary, clear proofs and supported him with the Holy Spirit. But is it [not] that every time a messenger came to you, [O Children of Israel], with what your souls did not desire, you were arrogant? And a party [of messengers] you denied and another party you killed. 2:253 Those messengers We endowed with gifts, some above others: To one of them Allah spoke; others He raised to degrees (of honour); to Jesus the son of Mary We gave clear (Signs), and strengthened him with the holy spirit. If Allah had so willed, succeeding generations would not have fought among each other, after clear (Signs) had come to them, but they (chose) to wrangle, some believing and others rejecting. If Allah had so willed, they would not have fought each other; but Allah Fulfilleth His plan. God made Yahya (A.S) John , a proof to testify the Prophet-hood of Jesus Christ (A.S) so that the people may recognize him and accept him. The Holy Spirit and Jesus (A.S) are different. It is the Holy Spirit (alaihiswalathu wa salam) who guides all Prophets and all Saints. Mark 1:13 and he was in the wilderness forty days, being tempted by Satan. He was with the wild animals, and angels attended him. Luke 4:2 where for forty days he was tempted by the devil. He ate nothing during those days, and at the end of them he was hungry. Matthew 4:2 After fasting forty days and forty nights, he was hungry. He was in the Wilderness undergoing the self struggle to become perfect to handle the burden and to overcome the hardships that will come in future in his way. It is confirmed in Hebrews. Hebrews : 2:18 Since he himself has gone through suffering and testing, he is able to help us when we are being tested. Hebrews 4:15 For we do not have a high priest who is unable to empathize with our weaknesses, but we have one who has been tempted in every way, just as we are–yet he did not sin. Hebrews 5:2 He is able to deal gently with those who are ignorant and are going astray, since he himself is subject to weakness. James 1:13 When tempted, no one should say, “God is tempting me.” For God cannot be tempted by evil, nor does he tempt anyone; 1:14 but each person is tempted when they are dragged away by their own evil desire and enticed. So if Prophets are not perfect, how can the revelation of God comes through them become perfect?. God make those perfect when He Almighty Chose from in pre-eternity, though they had to go through various trials and tests to gain experience of this world and to adapt to it’s nature and to prepare their personality to fight the evil of this world!. This are some of the examples on it people may think and understand the truth. Matthew 11:27: “All things have been committed to me by my Father. No one knows the Son except the Father, and no one knows the Father except the Son and those to whom the Son chooses to reveal him. John 17:2 For you granted him authority over all people that he might give eternal life to all those you have given him. Allah says in Quran: 3:26 Say, “O Allah , Owner of Sovereignty, You give sovereignty to whom You will and You take sovereignty away from whom You will. You honor whom You will and You humble whom You will. In Your hand is [all] good. Indeed, You are over all things competent. 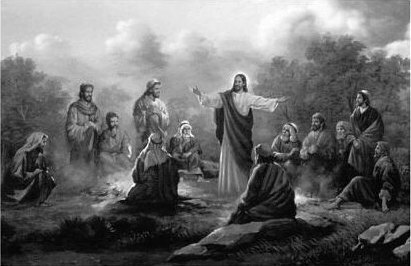 In this state of Spiritual Authority over the creations (Qutubaniyath), the leadership of guiding the Creation Jesus Christ had said that he is given authority over all. This verses shows father , Jesus and holy Spirit are not one and equal or he is an incarnation of god nor begotten son of God , rather he was a chosen Prophet of God. John 20:16 Jesus said to her, “Mary.” She turned toward him and cried out in Aramaic, “Rabboni!” (which means “Teacher”). But when Christ (A.S) returns from the Spiritual Ecstasy and Divine Annihilation (Fana fillah) he came to his own conscious and said:John 14:28 “You heard me say, ‘I am going away and I am coming back to you.’ If you loved me, you would be glad that I am going to the Father, for the Father is greater than I. Mark 10:18 “Why do you call me good?” Jesus answered. “No one is good–except God alone. Luke 6:12 One of those days Jesus went out to a mountainside to pray, and spent the night praying to God. This station is Wahdathul Wujood, which is when the servant of God become close to him God prevails in His Servant and his own self perish. This is in the ranks of the Prophets Awliya Allah (Friends of God), in whom their own self has perished and truth has come in them. This is the same principle ignorant and misguided sects among Muslims too denying today! Traditional Sunni Muslims see Prophets and Saints (Awliya Allah) in high status, because it is they in whom the Truth as all falsehood have vanished in them and Truth Prevails (Light of God). So who are those men to whom God is closer than their own veins?, they are the Friends of God (Awliya Allah-Saints of Allah). All Prophets are Saints, but all Saints are not prophets!. So many foolish misguided sects in Islam deny spirituality and Sufism. the above hadith and Quran verse refutes them very clearly. In the End of his Office in this world, he said: John 16:7 But very truly I tell you, it is for your good that I am going away. Unless I go away, the Advocate will not come to you; but if I go, I will send him to you. Some people still insist that we should follow Jesus (A.S), but he says: “Leave me, it is for your own good that I am going away”. Some Pastors from evangelical Church have told me holy spirit is the spirit of Jesus and when his body leave the spirit comes. I really shocked to hear that, as their theology says: father ,son and spirit are three distinctive persons. But in the Bible verses Jesus Christ (A.S) pointing to certain distinct individual (Spirit of Truth) who would come as an Advocate. From the Confusions comes new ideologies and beliefs. No Prophets from Adam (A.S) until Last Prophet (S.A.W) worshiped God in three persons nor believed or preached God exist in three persons. What was in the life of Christ (A.S) is the spiritual annihilation (Fana) in Allah and the absence of the self (ego)!. It is the purification of the self from everything other than God. Before Christ, the Prophets did not worship God in two as Father and holy spirit!. It is clear evident. Colossians 2:8 See to it that no one takes you captive through hollow and deceptive philosophy, which depends on human tradition and the elemental spiritual forces of this world rather than on Christ. James 1:17 Every good and perfect gift is from above, coming down from the Father of the heavenly lights, who does not change like shifting shadows. Isaiah 48:11 For my own sake, for my own sake, I do this. How can I let myself be defamed? I will not yield my glory to another. Will God let his (so called) incarnation or son to be defamed and disgraced by enemies of God?. Never! So the belief Jesus is god is not true, also the beliefs and sayings about Jesus : he was speaking and doing in his human side sometimes, and some times he was speaking or doing in his divine side, is not true, the verse in James 1:17 clears the confusion! Hebrews 3:1 Therefore, holy brothers and sisters, who share in the heavenly calling, fix your thoughts on Jesus, whom we acknowledge as our apostle and high priest. Quran says: 5:75 Christ the son of Mary was no more than a messenger; many were the messengers that passed away before him. His mother was a woman of truth. They had both to eat their (daily) food. See how Allah doth make His signs clear to them; yet see in what ways they are deluded away from the truth! Hebrews :6:20 where our forerunner, Jesus, has entered on our behalf. He has become a high priest forever, in the order of Melchizedek. When Christ (A.S) returns, everyone will believe in him as the Servant and Prophet of God. Bible too says: Hebrews 3:2 He was faithful to the one who appointed him, just as Moses was faithful in all God’s house. The Rank of Jesus Christ (A.S) above Moses (Peace be upon him): Bible Hebrews 3:3 Jesus has been found worthy of greater honor than Moses, just as the builder of a house has greater honor than the house itself. It is clearly say that Jesus’s prayer is heard (Answered/accepted) by God, that he shall be saved from the crucifixion and death! So does God speak and then not act?, does he promise and not fulfill?. Also if the death of Christ was an eternal divine plan to redeem humanity and give salvation, then why should Christ pray to God to avoid death on the cross?, when you belief Christ is the only perfect man and share glory and power of God equally? Hebrews 6:17 Because God wanted to make the unchanging nature of his purpose very clear to the heirs of what was promised, he confirmed it with an oath. Again read, even if Christ (A.S) jump from a hill, the Angels are appointed to protect him from all dangers. This is a prophesy in Old testament that Messiah will not be harmed at all. Hebrews: 5:11-12 We have much to say about this, but it is hard to make it clear to you because you no longer try to understand. In fact, though by this time you ought to be teachers, you need someone to teach you the elementary truths of God’s word all over again. You need milk, not solid food! You need Milk -the spiritual knowledge (learn about how Milk is derived in Mother’s breast) , not solid food which means Books and writings!. This is writing in the time of Hebrews apostles, what about now then after 1900 years? Hebrews 5:13-14 Anyone who lives on milk, being still an infant, is not acquainted with the teaching about righteousness.But solid food is for the mature, who by constant use have trained themselves to distinguish good from evil. Quran: 19:36 [Jesus said] Verily Allah is my Lord and your Lord: Him therefore serve ye: this is a Way that is straight. John 12:31 Now is the time for judgment on this world; now the prince of this world will be driven out. The verse describes the coming of the Dark ages in the World. It is said the Light from Jesus Christ (A.S) will be with people just for a little while longer ! John 12:35-36 New International VersionThen Jesus told them, “You are going to have the light just a little while longer. Walk while you have the light, before darkness overtakes you. Whoever walks in the dark does not know where they are going.Believe in the light while you have the light, so that you may become children of light.” When he had finished speaking, Jesus left and hid himself from them. John 14:16 And I will ask the Father, and he will give you another advocate to help you and be with you forever–12:46 I have come into the world as a light, so that no one who believes in me should stay in darkness. Jesus not a Judge: John 12:47 “If anyone hears my words but does not keep them, I do not judge that person. For I did not come to judge the world, but to save the world. The Prediction of the Coming Judge:John 12:48 There is a judge for the one who rejects me and does not accept my words; the very words I have spoken will condemn them at the last day. John 16:13 But when he, the Spirit of truth, comes, he will guide you into all the truth. He will not speak on his own; he will speak only what he hears, and he will tell you what is yet to come. John 16:8-11 When he comes, he will prove the world to be in the wrong about sin and righteousness and judgment: about sin, because people do not believe in me;about righteousness, because I am going to the Father, where you can see me no longer;and about judgment, because the prince of this world now stands condemned. Deuteronomy 33:2 He said: “The LORD came from Sinai and dawned over them from Seir; he shone forth from Mount Paran. He came with myriads of holy ones from the south, from his mountain slopes. God’s Light and Guidance reached through Moses (A.S) in Sinai, Jesus in Seir , and he shone forth from Mount Paran, which is known as “Jabal Noor” mountain of Light. Habakkuk 3:3 God came from Teman, the Holy One from Mount Paran. His glory covered the heavens and his praise filled the earth. The above verse clearly states that the Coming of Prophet Muhammad (saw) with God’s Light and Guidance from Mount Paran (Arabia). No Israeli Prophets coming from Paran!. The Name “Muhamamd” means “Praised one” and his praise is celebrated in all over the world with greetings of Peace and Blessings upon him and his family. Gospel Laws were never put in to any nations, but Islamic Shariah does. The whole world was went into Dark ages and Islamic traditions and laws prevailed all the world. European Renaissance was also emerged by the influence of Islam! Isiah 42:4 English Standard Version: He will not grow faint or be discouraged till he has established justice in the earth; and the coast lands wait for his law. Prophet Muhammad (s.a.w) was not discouraged or grow faint. Quran says in 9:40 If you do not aid the Prophet – Allah has already aided him when those who disbelieved had driven him out [of Makkah] as one of two, when they were in the cave and he said to his companion, “Do not grieve; indeed Allah is with us.” And Allah sent down his tranquillity upon him and supported him with angels you did not see and made the word of those who disbelieved the lowest, while the word of Allah – that is the highest. And Allah is Exalted in Might and Wise. Isaiah 42:2 He will not shout or cry out, or raise his voice in the streets. John 12:44 Then Jesus cried out, “Whoever believes in me does not believe in me only, but in the one who sent me. Matthew 27:50 And when Jesus had cried out again in a loud voice, he gave up his spirit. John 11:43 King James Bible And when he thus had spoken, he cried with a loud voice, Lazarus, come forth. Isaiah 42:3 He will not crush the weakest reed or put out a flickering candle. He will bring justice to all who have been wronged. Quran says: 21:107 And We have not sent you, [O Muhammad], except as a mercy to the worlds. Quran 39:53 Say: “O my Servants who have transgressed against their souls! Despair not of the Mercy of Allah: for Allah forgives all sins: for He is Oft-Forgiving, Most Merciful. The Law of Islam has reached in India, Sri Lanka, Cyprus, Indonesia, Zanzibar, America , Malaysia, Central Asia,North Africa, West Africa, South Africa and all other parts of the world. No laws or legal systems were established according to the Bible. Still the believers follow the laws and orders of Islam, though the people are not perfect. Isaiah 42:6-7 “I, the LORD, have called you in righteousness; I will take hold of your hand. I will keep you and will make you to be a covenant for the people and a light for the Gentiles,You will open the eyes of the blind. You will free the captives from prison, releasing those who sit in dark dungeons. Quran says: 4:174 O mankind! verily there hath come to you a convincing proof from your Lord: For We have sent unto you a light (that is) manifest. Quran 5:16 By which Allah guides those who pursue His pleasure to the ways of peace and brings them out from darknesses into the light, by His permission, and guides them to a straight path. Isaiah 42:10 Sing to the LORD a new song, his praise from the ends of the earth, you who go down to the sea, and all that is in it, you islands, and all who live in them. The new song, a new book, nothing is patched with the old one, for all people. Isaiah 42:11 Let the wilderness and its towns raise their voices; let the settlements where Kedar lives rejoice. Let the people of Sela sing for joy; let them shout from the mountaintops. Kedar is the Ishmael tribes who live in Arabia,the land in the mountain of Paran. Isaiah 42:13 The LORD will march out like a champion, like a warrior he will stir up his zeal; with a shout he will raise the battle cry and will triumph over his enemies. Only The Prophet Muhammad (s.a.w) lead in Wars and March forth like a Champion. and he gain victory of his enemies and established the religious laws in Arabia (Kedar). According to Christianity, Jesus died a fatal death on the cross after disgraced flogging and dragged in the lands, contrary to God’s Promise mentioned in Bible that Messiah will be protected from enemies and will be saved due to his great submission (ref: Hebrew 5:7). The Makkah victory and establishing of Rashidun Caliphate, and until 1925 Islamic Caliphate reigned in Holy Lands, and it is coming back soon after the 100 years of oppression and tyranny, hopefully by 2025. As this period is known and predicted in Hadith as the time of corruption and deception of Anti-Christ! Isaiah 42:16 I will lead the blind by ways they have not known, along unfamiliar paths I will guide them; I will turn the darkness into light before them and make the rough places smooth. These are the things I will do; I will not forsake them. It is known that the lost Israeli tribes are Muslims today, the Pashtuns and Pathans, it is said that in the Last days the flag flag will come from Khorasan (province spread between Iran, Afghanistan and Pakistan) by the descendants of Issac (A.S), and they will reach in Jerusalem. Another reason state of Israel want to kill people in drone attack by the help of America, by inbreeding terrorism there, the purpose of Taliban is to extinguish the children of Isaac from there to prevent them reaching in state of Israel!. They infiltrate terrorism there though paid mercenaries and they will kill innocent people, then the world will wage so called war on terror in that part of the world which the war and terrorists together kill the children of Isaac indiscriminately. Search Youtube “The Israelite Origin of Pashtuns and Pathans”. Anyway God’s Plan only Succeed. Not Mossad’s or CIAs! Isaiah 43:17 But those who trust in idols, who say to images, ‘You are our gods,’ will be turned back in utter shame. Quran 112: 1-4Say, “He is Allah , [who is] One,Allah, the Eternal, Absolute;He neither begets nor is born,And there is none like unto Him. But Bible says, Anti Christ (False Messiah) will come as a God in Flesh, true Messiah did not claim to be God or did not ask to worship him! 2 Thessalonians 2:3 Don’t let anyone deceive you in any way, for that day will not come until the rebellion occurs and the man of lawlessness is revealed, the man doomed to destruction. 4:He will oppose and will exalt himself over everything that is called God or is worshiped, so that he sets himself up in God’s temple, proclaiming himself to be God. Isaiah 66:17 “Those who consecrate and purify themselves to go into the gardens, following one who is among those who eat the flesh of pigs, rats and other unclean things–they will meet their end together with the one they follow,” declares the LORD. their end together with the one they follow, that is Anti Christ!. Then the man of lawlessness will be revealed, but the Lord Jesus will kill him with the breath of his mouth and destroy him by the splendor of his coming. We must know what are the laws of Torah and Enjeel, the 10 commandments. Who violate it especially the greatest commandment will find their end! The greatest commandment is to worship Lord Alone. Jesus did not change it, nor he said to worship him. He worshiped his God. Isaiah 42:21 It pleased the LORD for the sake of his righteousness to make his law great and glorious. Lawlessness is from Satan: 2 Thessalonians 2:9-10The coming of the lawless one will be in accordance with how Satan works. He will use all sorts of displays of power through signs and wonders that serve the lie,and all the ways that wickedness deceives those who are perishing. They perish because they refused to love the truth and so be saved. In the Islamic Shariah, the divine laws are made great and glorious, the elect (Scholars) are holding fast to it and the believers loving to follow it as a Mercy from God. Also in Zechariah 14:9 The LORD will be king over the whole earth. On that day there will be one LORD, and his name the only name. Only God’s Name will be there, people will not worship other Created beings or idols. They will worship the God of Abraham, Issac, Jacob, Moses and Jesus (Peace be upon them). All other confused ideologies will perish. Isaiah 43:11 I, even I, am the LORD, and apart from me there is no savior. Isaiah 43:12 I have revealed and saved and proclaimed– I, and not some foreign god among you. You are my witnesses,” declares the LORD, “that I am God. Do not make a Prophet as god, there is second or third god among us, except the One Mighty and Sublime. Wa salamun alal Mursaleen walhamdulillahi Rabbil Aalameen. *** This article is written based on Quran, New Testament and Old testament, as majority Muslims disagree, it is only an attempt to show the truth to people from what they have and what they trust and what they follow!. The truth is hidden everywhere, it is just to reveal to those heart that are blinded from seeing it.